This is a sponsored post on behalf of mike's hard lemonade. I'm a huge fan of cocktails, but as much as I love pushing the envelope with fancy bitters and exotic alcohol - nothing beats the pure simplicity of a classic Manhattan or an Old Fashioned. Last month I spent some time in Vegas Las Vegas (where I sampled many many Old Fashioned derivatives). I realized that there was really no reason why you had to stick with tradition. 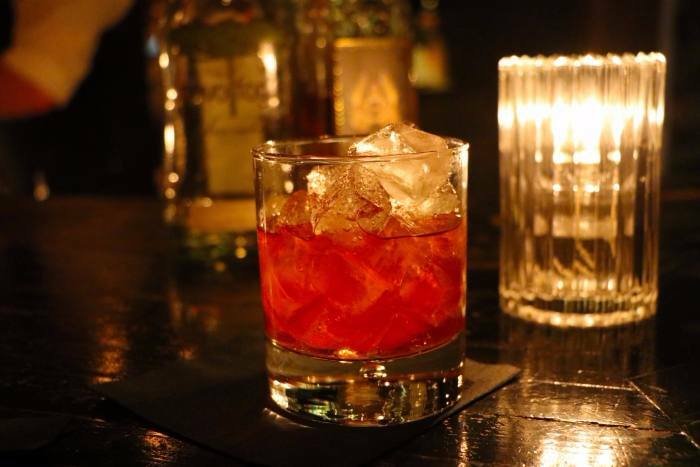 Old Fashioned Or Manhattan might be the name ... but really, there's no reason why you can't swap bourbon for rye or even cachaca! While these classic cocktails might be simple compared to other creations on the menu they still require ingredients that many of you don't have handy. This got me thinking about what I could make that was just as good without having to worry about adding bitters, simple syrup, or vermouth. Luckily I had brought a case of mike's hard lemonade Party Pack with me to the suite along with a bottle of Basil Hayden, so I had the fundamentals. 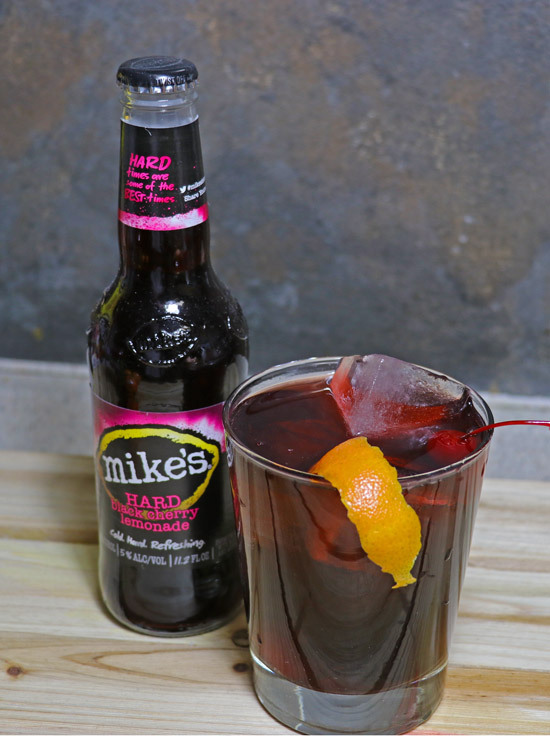 With a variety of flavors, the mike’s Party Pack highlights all of mike’s hard lemonade’s high-quality, natural ingredients and has something for everyone (making it perfect to bring along to a holiday party or gathering). Initially I create a whiskey sour, but Mike's Hard Lemonade - while extremely tasty on it's own - wasn't as sour as I needed. So I continued to experiment by mixing mike's hard cherry lemonade with the bourbon. Surprisingly, just adding the two together came pretty close to delivering a proxy of a classic Old Fashioned but it wasn't sweet enough and lacked flair. Upon arriving home though, I was able to tweak things a bit more and came up with my special holiday cocktail, the Mike's Merry Cherry Old Fashioned. 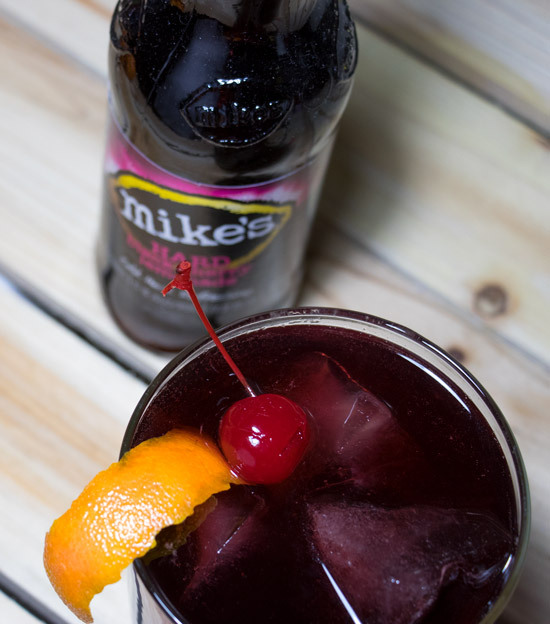 Place ice in the glass, and combine 4oz of mike's hard cherry lemonade, 2oz of bourbon whiskey, 1oz maraschino cherry juice and stir the mixture. Peel part of the orange for garnish and express the oils, then squeeze half the orange juice into the cocktail and top with a cherry. If don't properly, you'll be able to still taste the whiskey, but it will be complicated by a delicious concoction that is a bit sweet and fruity but still clearly a "Man's Drink".